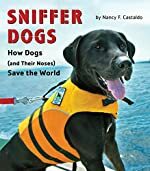 Sniffer Dogs: How Dogs (and Their Noses) Save the World by Nancy F. Castaldo. Review: Growl! Bark! Pant! These are some things that rescue dogs do on the job. Sniffer Dogs, a nonfiction book, stars dogs and their trainers rescuing people in life threatening situations. This book tells how dogs and their noses can save peoples lives. If that sounds interesting, then you should read Sniffer Dogs by Nancy F. Castaldo. Sniffer Dogs is a collection of real life stories that involve dogs that rescue people in frightening settings like fires, hurricanes, and tornadoes. This book is filled with photographs and stories of all kinds. For example, one story was about the 9-11 catastrophe when a girl was trapped on the top floor of one of the buildings that was hit. The book gives details about how one of the rescue dogs uses his fantastic sense of smell to find her. Is she dead or is she alive? Read Sniffer Dogs to find out. In my opinion, Sniffer Dogs was really interesting, and the pictures helped me visualize some of the more complex stories. Each page kept me reeled in, and the stories sometimes made me want to cry and sometimes laugh out loud. I recommend this book to people 10 and older because of the complicated vocabulary that might be challenging for younger ages. Examples of higher level words are smuggling, boisterous, and biology. I would also say that this book is meant for dog lovers, because it is all about dogs. I wish that the author had been clearer with some of the events in the story. For instance, when she was describing the cone formation, I had to look at the picture twice to fully understand what she was saying. Overall, Sniffer Dogs was fascinating and kept my interest all the way through the book. Review written by Makayla (6th grade student). We would like to thank Houghton Mifflin Harcourt for providing a copy of Sniffer Dogs: How Dogs (and Their Noses) Save the World for this review. Have you read Sniffer Dogs: How Dogs (and Their Noses) Save the World? How would you rate it? Thanks, Makayla, for this thoughtful and well-written review! I'm so glad you enjoyed reading Sniffer Dogs!